This morning was shaping up to be a "Terrible, Horrible, No Good, Very Bad Day"*, but I ran into just the right person at the right time. After a restless night, John's alarm went off at 6. I was glad when he reset it for 6:30. Unfortunately, I didn't hear him get up. My MIL woke me up at 7 (when she realized that wasn't me in the shower). The car window was covered in ice, but I thought we would still make it to Chewie's bus stop in time. (That is his, alternate bus stop when we miss the first one.) Wrong. So we had to drive Chewie to school, making us late for Crunchy's doctor appointment. We like to prepare our kids for what is coming, but we may need to rethink that plan with Crunchy. As soon as she learned they were going to draw blood, she began freaking out. Major meltdowns followed. We survived the blood draw with lots of tears (including my own) and headed to school. In Crunchy's room, I found now one, but two substitutes. There was a sub for her long term sub (who has been here since Christmas) and a sub for her associate (aka "teacher's aid). Yikes! I left my cell number just in case. I finally headed out (late for my 9:oo appointment) and I saw my friend Meg (who teaches art at various elementary schools). She asked the customary "How are you? ", but she wasn't happy with my half-hearted "fine". She pressed just a bit, and I threw out a few of the stressors in my day, so far. She said, "Stop!" (walking) and caught up with me. Right there on the sidewalk in front of our school, Meg wrapped me in a hug and held me while I cried. Then she prayed for me. Ironically, last night after a discussion about healthy families, our group talked about how we often lie when people ask how we are doing. Or if we do answer, we quickly find out they didn't really want to know. I am so thankful that Meg was there right when I needed her. And that she didn't settle for "fine". 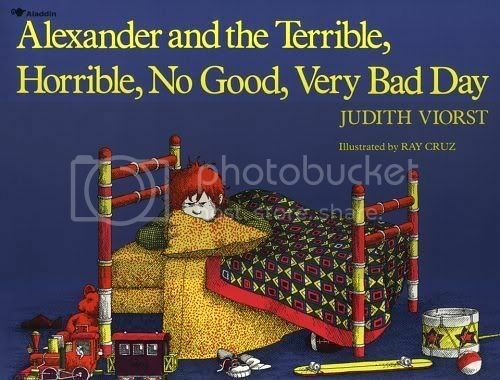 *Apologies to Judith Viorst who wrote Alexander and the Terrible, Horrible, No Good, Very Bad Day. So glad God sent an IRL friend to give you and IRL hug!